Not long ago, out with friends, I spotted a Risotto on the menu: $17.95 for the basic, with prices escalating depending on the “add-ins.” Tempted to try it to see what wonderment would command such a high price, I decided to go with something that’s not so inexpensive & easy to make at home. And if it could be made easier? Even better! So if you’re wondering, yes, Cook’s Illustrated’s method worked beautifully. You’ll still need to be on hand for the 30 minute cook time, but this recipe allows you to do all the shifting and shuffling necessary to get dinner on the table in between short little stirs, several minutes apart. 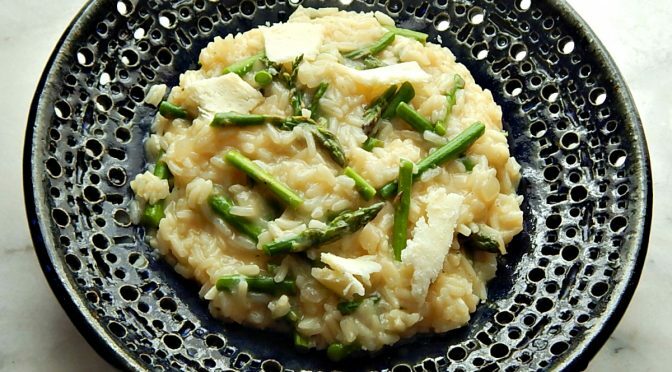 This recipe is for Asparagus Risotto, but Risotto is so adaptable. Once you have this basic method down, you’ll probably want to make all your Risotto with it. Just vary what you put in at the end. Meat and/or veggies. Betcha didn’t know that Risotto can be made with plain old rice, wine and grocery store block Parmesan for well under five bucks? If you don’t have or don’t want to use wine, a Risotto like this can be made with no wine at all. Just use a bit more stock and add about a 1/2 tablespoon (to taste) of white wine vinegar to finish. If money’s no object, of course, use the best ingredients you have on hand. Risotto is a great dish to use when there’s leftover asparagus. Or almost any leftover vegetables you have on hand. You won’t be able to simmer the ends of the asparagus in the chicken stock, but that’s only one level of flavor in this dish. While leftover Risotto tastes great (usually it needs a bit more liquid) it suffers a bit in texture; an even better use for leftover Asparagus Risotto is Arancini, delicious balls of cheese stuffed Risotto, breaded and deep fried. Prepare the asparagus by breaking off and discarding the tough ends – take one or two spears and hold near the tip and the end and bend. It will naturally break at the tough part. Line up the tip ends with the rest of the asparagus and slice through all the spears at once where the first one broke. Don’t worry about waste, you’ll toss those tough ends in your stock. Cook the rest of the asparagus to tender-crisp, then cut into 1 to 1 1/2-inch pieces (tips longer, base shorter.) If your asparagus is especially large, cut into smaller (bite-size) pieces. Set aside. See Cooking Asparagus in the Microwave or use your favorite method. Don’t discard the cooking water yet. You may need it later if you need more moisture in the Risotto. In a 3 or 4 quart heavy saucepan or Dutch oven, heat olive oil over medium heat. Add the onion and cook for a few minutes until translucent. Add salt and pepper. Add the rice and cook for 3 minutes or so, stirring until rice is nicely coated in the oil and becoming translucent around the edges. Add the wine to the rice. Slowly stir, allowing the rice to absorb the wine. Once the wine is almost completely absorbed, add 3 cups of the hot stock and stir, and continue to stir now and then (once every three or four minutes) for about 12 minutes until most of the stock is absorbed and the bottom is nearly dry. Use a whisk if using regular old rice. When finished, remove from heat. You want to end up with al dente rice and a creamy sauce – it will thicken a bit more when you add the Parmesan. Gently stir in the Parmesan cheese, the butter, and the asparagus. Add salt and pepper to taste. Add additional stock or liquid from asparagus if it needs to be moistened. Risotto should flow like lava when plated. Serve immediately. Arancini – breaded & fried risotto balls stuffed with Mozzarella cheese. This entry was posted in Click here for Bargain Meals, Click here for Fabulous Food Posts and tagged Asparagus, Bargain Meal of the Week, Cheese, Chicken Stock, Cook's Illustrated, hearty sides, Heritage Recipe, leftover asparagus, leftover vegetables, Leftovers, Parmigiano-Reggiano, Rice, Risotto, Side, Vegetarian Meal, Vinegar, Wine. Bookmark the permalink. Love that you’re making your own chicken stock for this recipe – here’s a link to my recipe for it if your readers ever need a reference! Thanks for leaving the reference here – I’ve thought about posting a recipe, but I make mine differently all the time…you covered that! I do add one item to my stock every time – 8 black peppercorns. I think they’re magic, and I don’t know why 8, but 8 it is. I enjoyed your blog, especially the encouragement to garden! Thanks! I love peppercorns as an ingredient, and I’ve never thought to throw them in stock – kudos for the tip!